Exchange Client Files Securely with Ease. Use File Locking to Edit QuickBooks with Desktop App to stop overwriting problems. After clients upload their QBW file –use our Desktop App to “Lock and Open” the QuickBook file stored in your MYDOCSONLINE account. True File Locking prevents others from changing the file as you do your work. Simply “Save and Unlock” file when you are done. A simple yet secure way for clients to transfer their accounting data directly to your web-based workroom so you can work locally. The Desktop App is easy to use and takes away all the accounting file editing and sharing headaches. Your Name. Your Logo. All accounts are provided with Professional Branding with your company logo. We keep you looking good in front of your clients. We do the work, and your are up running in a couple hours. Get same day turn around Monday through Friday with branding. Send us your logo today! We at MYDOCSONLINE have a simple yet secure way for your clients to transfer their accounting data directly to your web-based workroom. OUT WITH THE OLD. Clients no longer have to copy files to CDs and send them to your office, or attempt at using insecure email attachments for file transfers. Say goodbye to hard to use FTP sites too. IN WITH THE NEW. Using your secure, professional web-based account at MYDOCSONLINE your client simply logs into their client-specific account folder to upload their files to you. All files are fully encrypted during transmission using HTTPS and Transport Layer Security. For large files over 2 GB you can use our Desktop App. Either way your files arrive SECURELY. With email notifications turned ON you can login to begin work ASAP. No delays. Begin EDITING QuickBook files using the Desktop App. Open your QuickBook files with “Lock and Open” to edit. 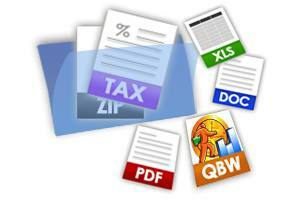 No worries of others accessing the files while you do your work. The MYDOCSONLINE Desktop App provides true FILE LOCKING unlike other services. When you are finished just click “Save and Unlock”. Your work is done. Now breathe easy and go get a cup of coffee! Your MYDOCSONLINE account can be used as a storage vault for past accounting, financial information or tax returns for each of your clients. The options are endless. We always enjoy chatting with clients. We certainly can get you started easily without all the stress. Our team has been around the block a few times too. Give us a call or shoot us an email , you’ll be glad you did. We promise!